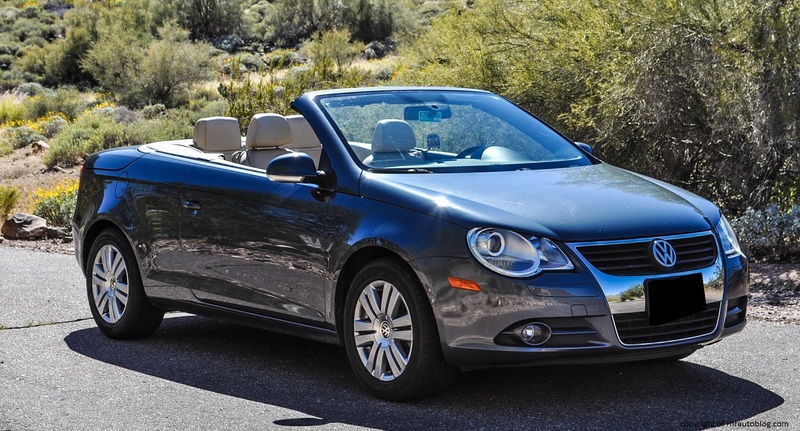 Whenever you think of a Volkswagen and a convertible in the same sentence, the association”chick car” comes to mind. Like for example, if you see a Volkswagen Beetle convertible on the street, you automatically assume that it is driven by a girl. Talk about sexism. 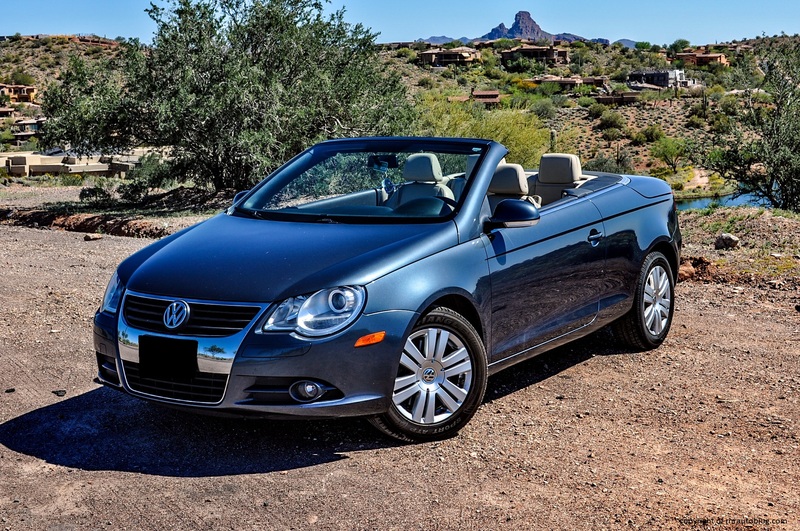 Volkswagen’s second convertible offering (up till 2014), the Eos was also subject to the chick car syndrome. 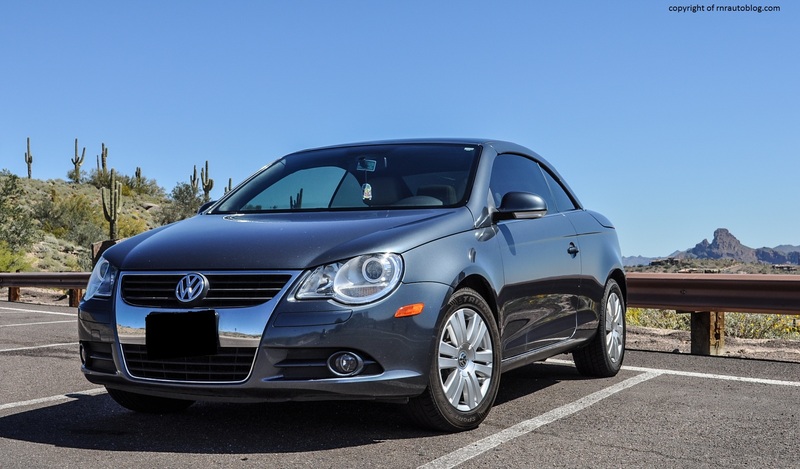 I wouldn’t drive a Volkswagen Beetle or an Eos but that’s not because of the stereotype. I just dislike convertibles in general. I also dislike Starbucks and Nutella, so I have pretty popular opinions. Right? 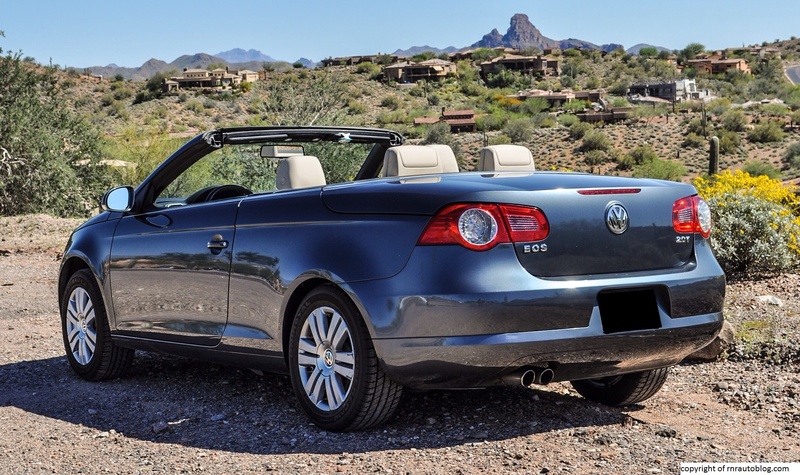 Anyhoo, the Eos debuted in 2007 in North America, and it boasted a metal hardtop roof, earning it the title of the cheapest metal hardtop convertible on sale at the time. 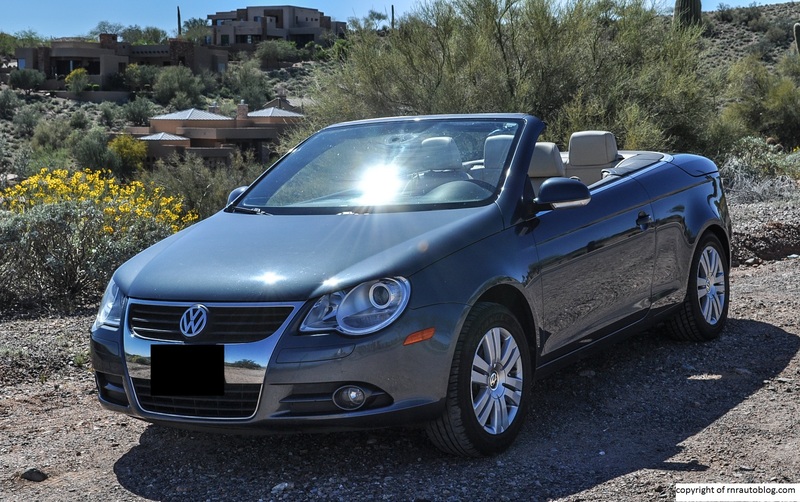 Right now, here we have a 2007 Volkswagen Eos. Considering its reputation as a chick car, you would assume that it is driven by a girl. You are right: it is driven by my first prom date. She was a cheerleader in high school, she is pretty, and I assume she likes shopping. So she fits the stereotypes of a girl who drives a chick car ( I am assuming). But there is one caveat. 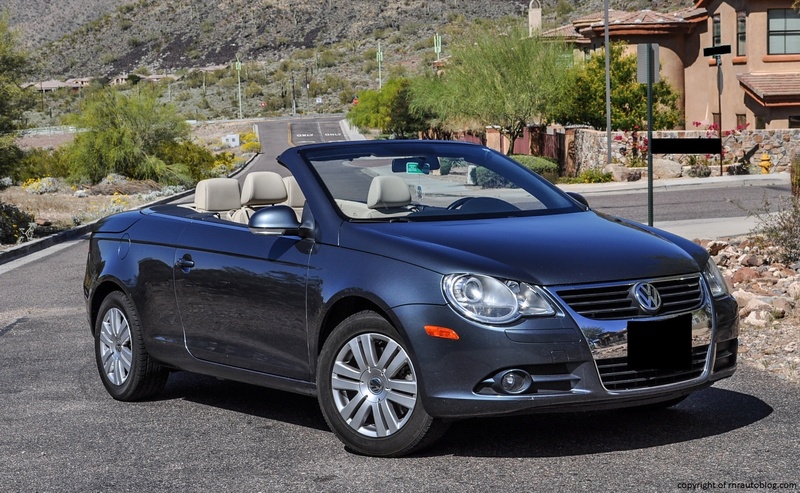 This Volkswagen Eos is a stick shift. That’s right, I converted my prom date to manual as she initially wanted an automatic for her first car. The stick shift is also the reason why I wanted to review an Eos even though I have already reviewed a 2012 Eos. With the automatic equipped refreshed Eos in mind, how does the pre refresh manual equipped Eos compare? 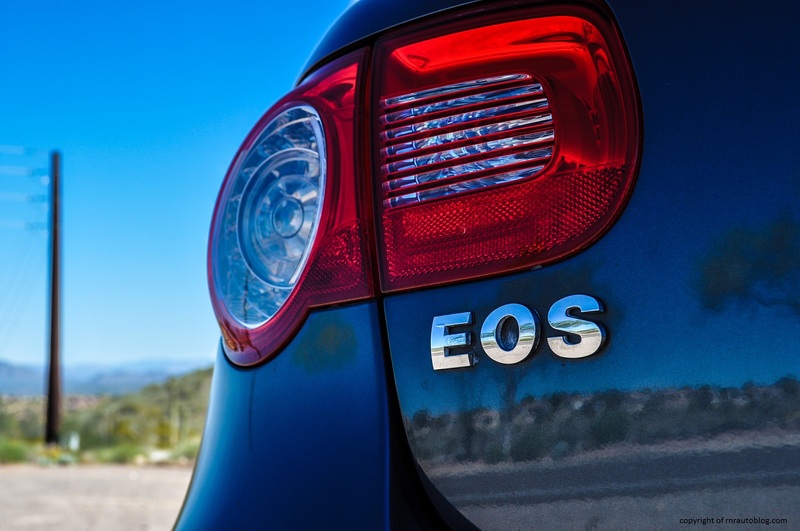 From an appearance standpoint, the Eos does come across as a chick car. 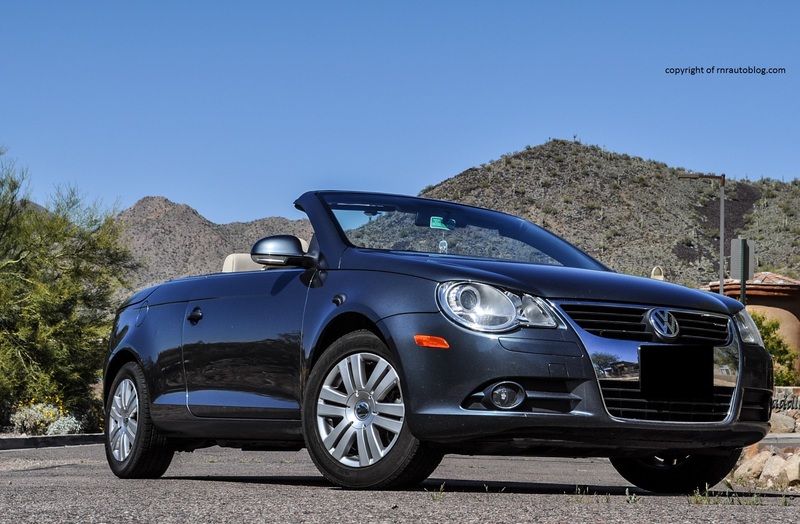 I don’t know how but maybe it is because subconsciously, whenever we think of a Volkswagen convertible (or Jetta) we think, “chick car.” Some of this is due to its generally soft styling. By soft, I mean if you look all around the car, there are no sharp angles or creases. It is more rounded and gentle. 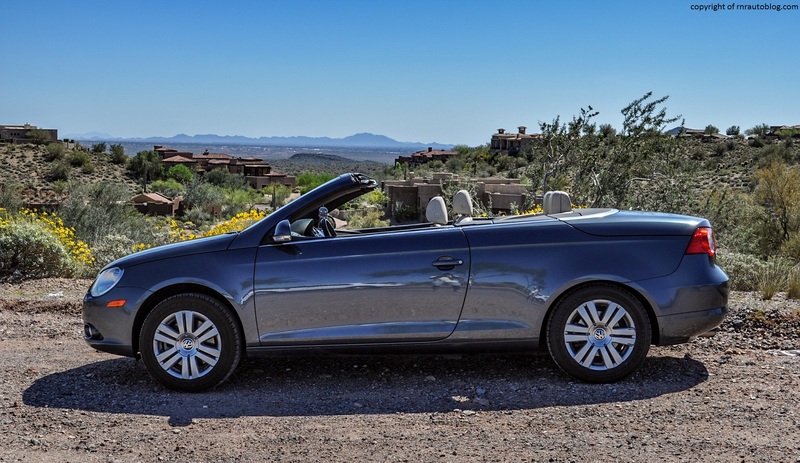 This works in the Eos’ favor, because it manages to look like an attractive convertible with the top down, but also an appealing coupe with the top up. 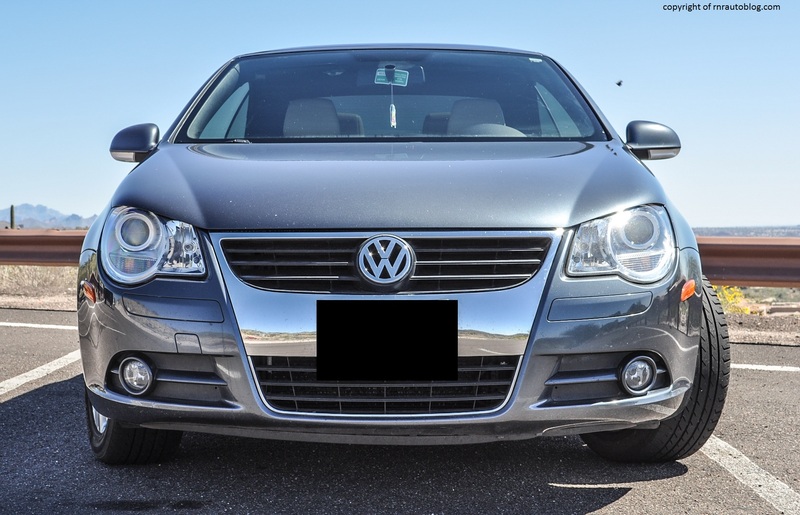 The front has large distinctive headlights that align neatly with Volkswagen’s full width grille. The hood has lines that stem from the edges of the grille, a nice touch. 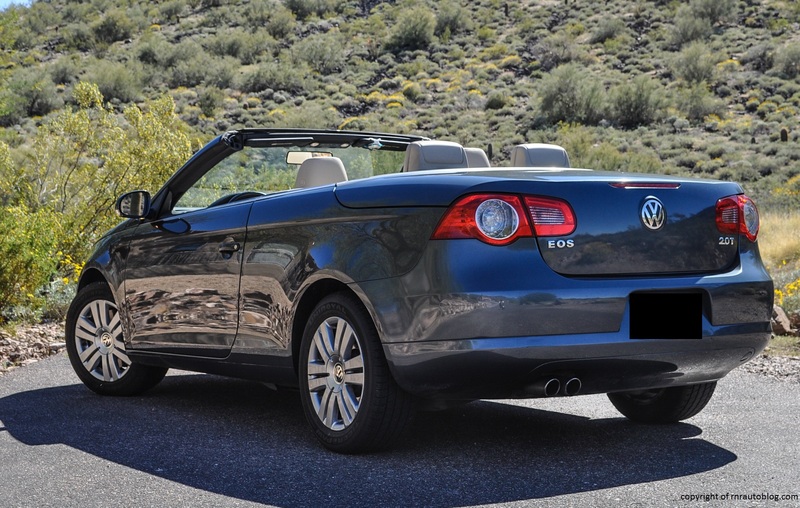 With the top up, its fwd underpinnings become apparent (The Eos is based off the fifth generation Golf’s platform). The hood seems a bit too short and the rear deck too long for my taste. Also, the trunk has noticeable lines for the hardtop which detracts from the clean design. Overall, it looks appealing, even more with the top down. The rear has attractive taillights, and I like how much detail is embedded into them. 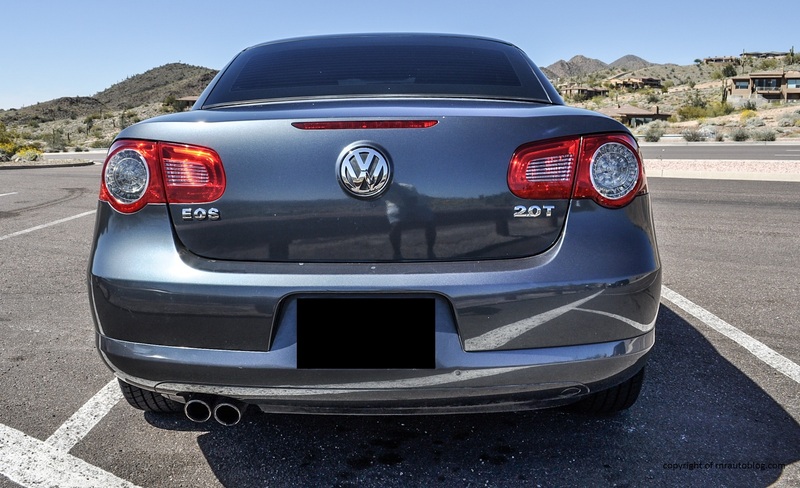 Cool fact: the rear VW logo doubles as a trunk opener. The interior is typically Volkswagen: understated if a bit unexciting. To sum up, the Eos has a clean design in and out that still looks good today, and the Island Gray metallic color is stunning, especially in the sun. This 2007 drives very much like the 2012 version that I reviewed. It is not outright sporty, but it is a competent handler. The steering is a bit light, and it is not the most talkative, but it is precise and accurate. There is some body lean, but it is not excessive, and it grips easily. However, if you do push it, it does run wide but it is still controllable. 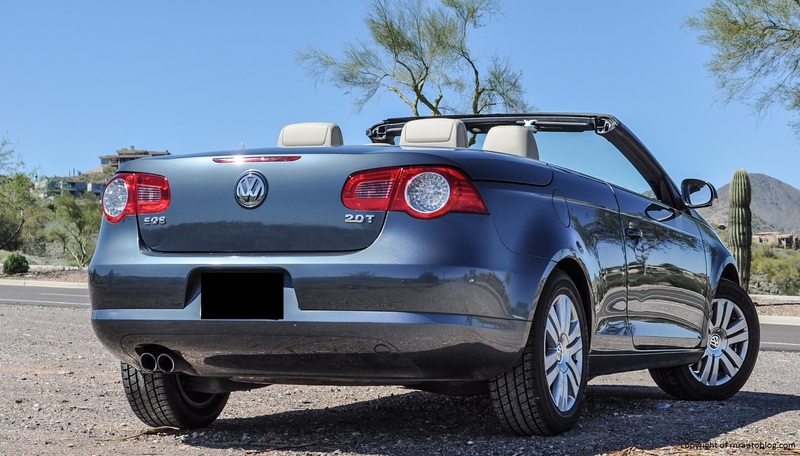 The weird thing is that even though it is a hardtop convertible (hardtop convertibles are usually heavier than they should be), it feels light on its feet. It turns in quickly and there is a nimble feeling that you wouldn’t associate with a car of this caliber. With the roof up, the ride is taut but controllable. Road imperfections are felt, but they are not uncomfortable. 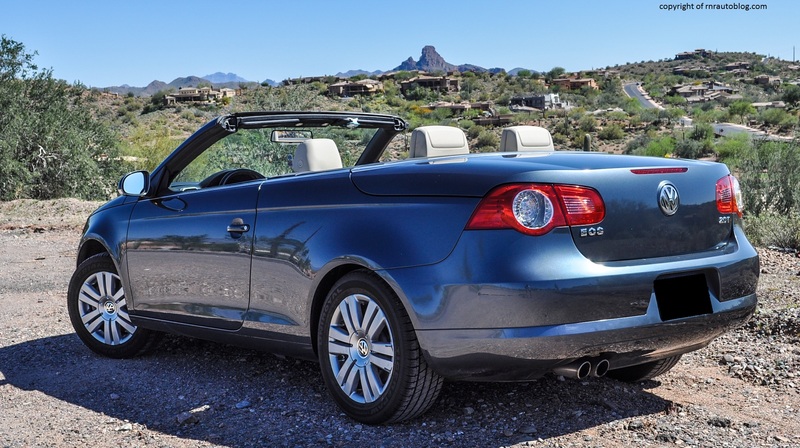 As with any convertible, there is still the possibility of the loss in rigidity in comparison to the equivalent sedan or coupe version. When you remove the top of a car, some rigidity is lost and the car overall becomes bendy because there is only the bottom to keep the entire car rigid. To compensate for this, manufacturers usually put strengthening beams on the bottom to account for the lost rigidity. Even with this, some manufacturers are still not successful, including Volkswagen. 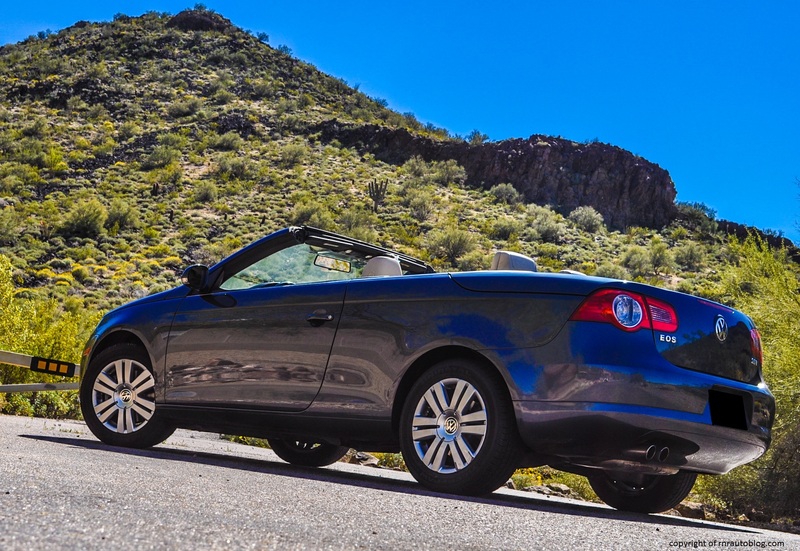 On a smooth road with the top down, the Eos does fine, but on any road with the mildest road imperfections, the car’s structure quivers. You can literally feel the structure bending. I would recommend that you save the top down motoring for special days. Fun fact: the engine in this Eos is the same as used in Volkswagen’s legendary Golf GTI. 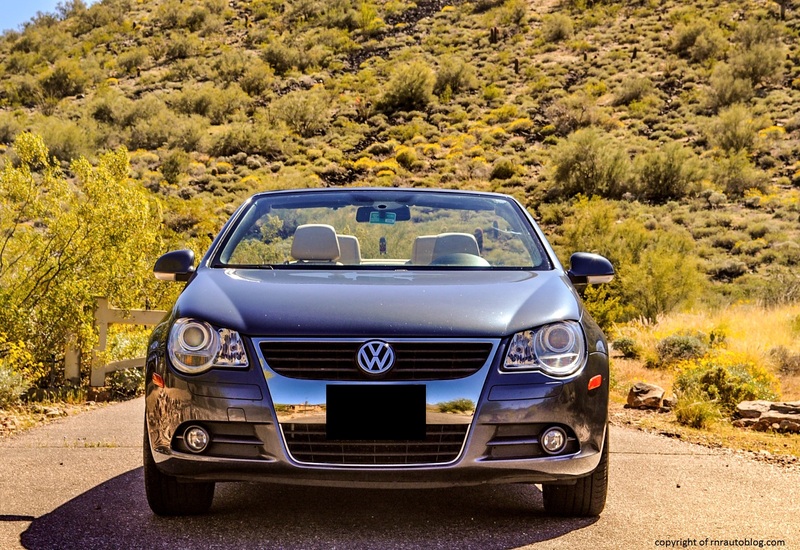 It is also used throughout Volkswagen and its luxury division, Audi’s lineup, and it is not hard to see why. The 2.0 liter turbocharged four cylinder with 200 horsepower is a magnificent engine (a 250 horsepower 3.2 liter V6 was available). Below 2,500 rpm, there is some turbo lag, and it feels underpowered. But pass that mark, and the 4 cylinder comes alive. It just pulls and pulls. It is not fast, but its surge makes it feel so. The way I see it, this engine has character. It is like a sleepy dog at low revs. You have to keep pushing, but when you do, it wakes up and becomes a ferocious wolf. Okay, ferocious may be a little strong, but it is properly quick and punchy. The way I see it, this little turbo four has character. 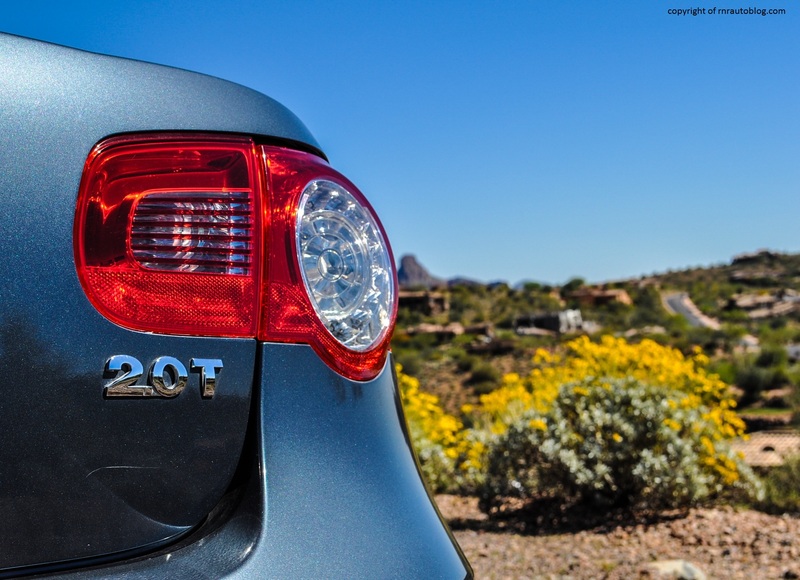 This engine is complemented by a silky smooth manual transmission. As typical of Volkswagens, the clutch travel is long but it has excellent feel. I encountered many hilly roads throughout my drive, and I just relied on the feel from the clutch, and the slick transmission made fast shifting a breeze. 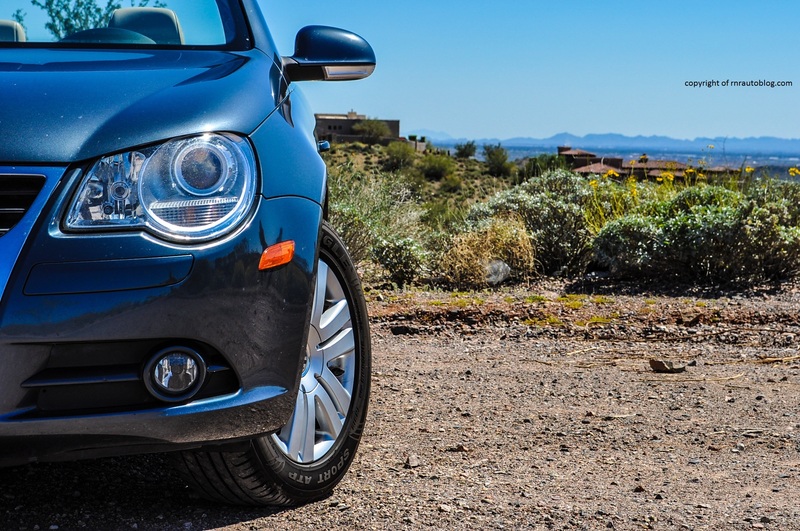 The more popular automatic transmission option, DSG, is an excellent automatic, and honestly, it suits this car better, but the manual transmission adds an extra element of fun and novelty that the automatic lacks. With the top up, it is quiet, although the built in sunroof lets in some wind noise, and the four cylinder engine hums at low revs. Floor it, and it emits a muted growl. As per Volkswagen tradition, the cabin is beautifully finished. The leather steering wheel feels nice to hold, and the materials used in the cabin are of high quality. Due to the long clutch travel, you do end up having to sit uncomfortably close to the wheel, and the driver’s seat does not move back far enough. There is enough headroom in the front to suit most people with the top up, and the sunroof is a delight. 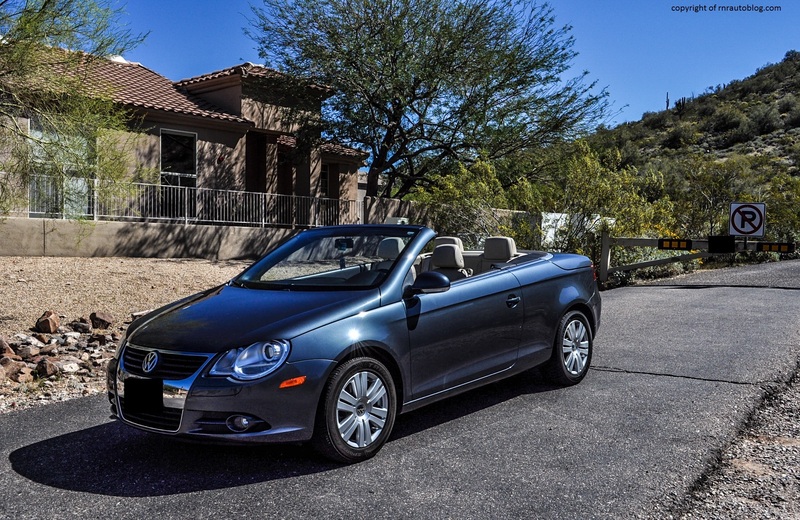 The Eos’ party card is that it is a convertible, but for those days that you do not need the top down, you can make do with the sunroof instead. As is expected of convertibles, the rear seat is tight even for two people, and legroom is nonexistent. Visibility with the top down is excellent, but with the top up, the visibility does suffer. You have to take extra caution when backing up due to the big pillars. The trunk is a reasonable size when the top is up, but even then, don’t count on it to take your luggage to the airport. 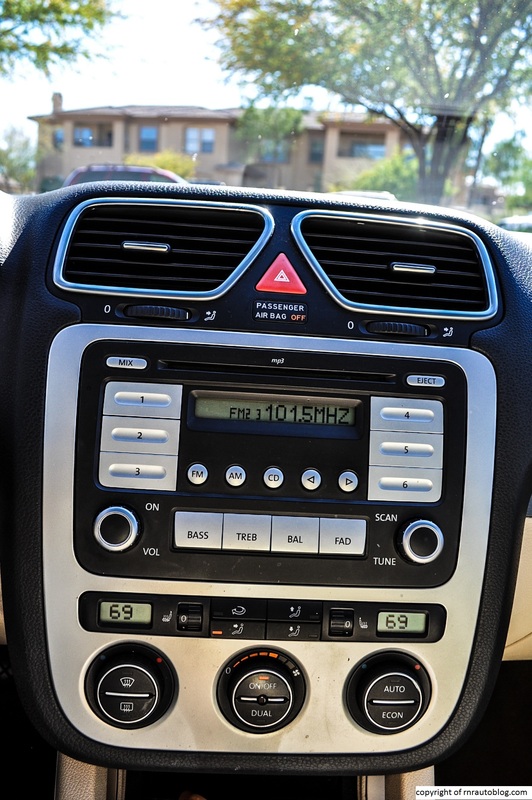 The controls are intuitive with big buttons and knobs that are easy to read. Even though this is the basic model, you can still enjoy dual zone climate control and seat heaters. The gauges are legible although the speedometer could be bigger in order to make it easier to discern 5-10 mph intervals. Getting into the car is fine enough, although getting in the backseat requires flexibility skills.